Two reviewers note that this sweet gift made their children’s teacher cry happy tears. But one reviewer cautions that, although this book is an incredibly thoughtful gesture, it’s a little labor intensive—especially for young kids. She recommends purchasing the book well in advance and having your child complete the prompts over the course of a few weeks. If that still seems like a lot for your family, why not get the whole class in on the present? Each child can fill out and sign one or two pages for a gift any teacher will cherish for a lifetime. It’s the perfect end-of-year gift for a teacher who really made a difference. These clever inspirational pencils may just replace a teacher’s favorite red pen. Even if he can’t use them to grade papers, these hot foil stamped no. 2 pencils will find a permanent home in the pencil cup on his desk. With phrases like “thoughts become words,” “words become actions,” “actions become habits,” “habits become character,” and “character shapes your destiny,” this set of five pencils pass on an important message that’s just right for an educator shaping young minds. Other versions with quotes from Albert Einstein and Winnie the Pooh are also available and just as appropriate for a teacher. If you’re feeling extra generous, gift a special pencil cup to go with the set. You know the saying “don’t talk to me before I’ve had my coffee?” Well, teachers have to talk to a lot of people before they’ve had a chance to finish their morning brew. No to mention, it takes a lot of energy to wrangle a room of kids. That’s why it’s a great idea to make sure your child’s teacher has a special place to rest her coffee. This pretty wooden coaster will do the job. It’ll protect book reports and lesson plans from coffee stains, plus it serves as a pretty piece of desk decor or a paperweight. Choose from eight vibrant colors, and have one or both sides laser engraved with the message of your choice. Reviewers comment on how beautiful this coaster is, noting it looks much more expensive than it is. They can multitask better than anyone. They put on a smile, no matter what. They work well beyond their pay grade. And they can somehow keep 20 elementary school-aged children quiet for an extended period of time. If anyone has superpowers, it’s a teacher. Show your child’s teacher that you know just how hard they work every day with this fun and functional tumbler. It’s 22 ounces, so she’ll stay hydrated all day long—even during those long June days in an unairconditioned classroom. Plus, thanks to this reusable insulated mug and straw, she’ll be doing her part to stay green. Reviewers remarked that the colors are even prettier in person, and note the high quality of the tumbler itself. 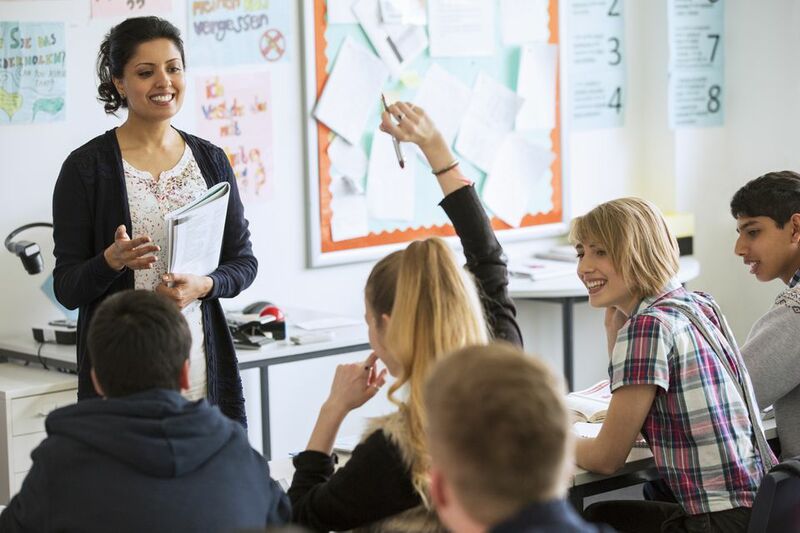 How do you adequately show your appreciation to a teacher who really makes the grade? Start with this fun little gift. You buy the trio of labels—thank you, A+, and Best Teacher—and a large bag of Hershey Kisses (one reviewer also attached the labels to mini Reese’s and mini Rollos, too), then enlist the kids’ help with a fun DIY project. Simply tape one label to the bottom of each candy. Once all of the labels are affixed to the chocolate, place them in a big basket, fill up a special mug, or put a few into clear cellophane bags and finish with a ribbon. Then distribute a handful to each one of your kids’ teachers. One reviewer notes what a cost-effective gift this is, especially when you’re gifting to multiple teachers at once: It cost her less than $60 to put together thoughtful gifts for seven teachers! This may not be how the dictionary defines the word teacher, but you know better. Show your favorite educator that you know the true meaning behind the word with this heavyweight cotton canvas tote bag. Though the tote itself would make a nice gift from one student, we love the idea of filling it with extra-special goodies to make a class gift to remember. Collect money from all of the families in the class, then buy this tote, and stuff it with gift cards—for lunch, coffee, school supplies, or maybe even a little luxury like a manicure—and other little goodies like a new red pen or a fun mug. Reviewers note the bag is particularly well made and crafted from quality fabric that’ll help it go the distance. Teachers are good at a lot of things—they’re creative, they’re patient, they can wrangle a lot of unruly kids, and they’re really, really smart. If your child’s teacher really knows her stuff, give her this funny mug. It’s perfect for an English teacher, though any educator will see the humor in it. This hand-printed ceramic mug, which holds 11 ounces, is perfect for coffee or tea, whatever her preference may be. Although the mug is technically dishwasher-safe, the custom design will last longer if the product is hand washed. Make the gift even more special—this Etsy seller is open to custom requests, and will personalize your mug upon request. Sometimes the best gifts are the most practical gifts. Teachers often spend their own money on school supplies and items they need to make their classrooms ripe for learning. With that in mind, give a little gift that will ease some of that burden. A definite step up from the standard stainless steel variety, this gold desk storage set will keep graded and ungraded papers separate and corralled, making her desk a more functional and organized space. A win-win for your child’s teacher and her students, since studies prove uncluttered spaces reduce anxiety and promote problem-solving and decision making. Reviewers note the item is larger than it appears in photos, but in this case, that’s a good thing, considering how many papers pass her desk. Whether he uses this message board for classroom announcements or as a place to post a rotation of inspirational quotes, it’s a fun addition to any learning space. The 1-inch plastic letters slide easily into the grooves on the board, making it easy and quick to change out the message on a daily basis. Kids will love walking into the room and seeing something new each and every day. It’s the little things that count! The letterboard comes with 188 1-inch plastic letters and punctuation symbols. Reviewers note that the frame is sturdy and attractive. One reviewer even notes that the message board doesn’t seem to attract dust—a welcome bonus in an old classroom. Teachers have a uniquely challenging job for so many reasons, not limited to the fact that they can only leave the classroom at very specific times throughout the day. That means teachers often have to cram in a quick snack at their desk during lunch. They basically live at their desks from the hours of 8 to 3 pm. This little gadget may seem silly, but it will keep that multi-functional space of theirs clean and in pristine condition, no matter how many times they have to eat hovered over a pile of book reports. Simply push the car to “drive” it around the desk, picking up crumbs, eraser shavings, dust, dirt, and any other small debris. Being on your feet all day is hard work. Add keeping a group of kids quiet and focused during lesson plans to the mix, and you have a recipe for pure and total exhaustion. Give the gift of a better night’s sleep with this luxurious silk pillowcase. Soft and comfortable, it comes in 30 different colors and seven different sizes.